Share the Love! Share Healing and Wellness to every Filipino Home! A one-time purchase of 1 box GREEN BARLEY worth 5995php for Metro Manila or 6370php for Provincial applicants entitles you of HEALTHWEALTH'S dealership oppurtunity. For Provincial Applicants you will receive a receipt as your proof of dealership. It will be sent to you through LBC. Avail of our Flexible Accumulation Program. Accumulate 28 bottles of GREEN BARLEY for 275/per bottle for Metro Manila, and 300/bottle for provinces. You can accumulate these 28 bottles in no time frame required. Once you accumulated the 28 bottles you will receive a receipt as your proof of dealership. THE PEOPLE WHO HAVE BEEN HELPED BY GREEN BARLEY. 1000PHP OVERRIDE COMMISSION will be given to you every time you sell a pair of Green Barley box. If you have a group that is active in selling our product you can still earn override commissions, even if you do not have sales. _Dealership Notes:A DEALER of HWIC is entitled to a Php500 Sales Commission every time he sells the HWIC Product Pack. A CUSTOMER can purchase as many HWIC Product Pack he wants, which the system automatically encodes. The system also tracks down the number of times he made his personal purchases through the Dealer Purchase Number (DPN). A DEALER is also entitled to discounts on products available at our Health e-Store. The uni-level plan will use the Dealer’s Purchase Number (DPN) to determine the direct referral. The uni-level plan will be utilizing the 8-level deep chain of DPN’s. The maximum total rebates each DPN will receive is 15%. Each DPN must have a personal sales at least Php1,000net from Health e-Store during the calendar month to be qualified to receive the monthly rebates. Mode of payment is either Cash and/or Voucher. The current position of the existing dealers upon implementation of the uni-level system will be carried over (Regular Dealer (RD), Bronze, Silver, Gold and Platinum). 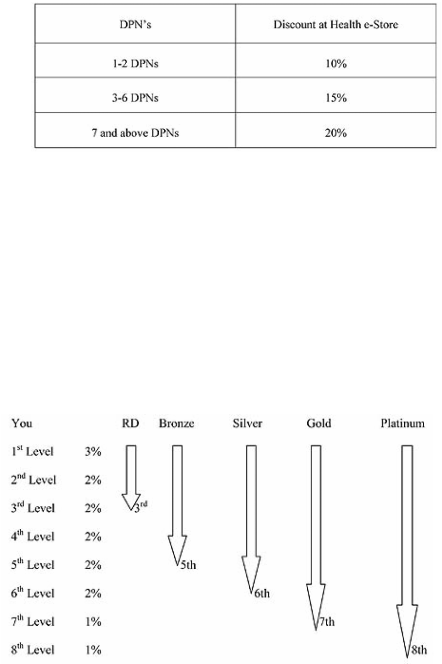 The qualifying sales for position for Bronze, Silver, Gold and Platinum will be the same. That is, Php25,000 net for Bronze, Php50,000 net for Silver, Php75,000 net for Gold and Php100,000 net for Platinum. The sales requirement for each position is accumulated and no time frame. There will be no demotion for all the positions. Products are available nationwide thru our Authorized Service Operators in Luzon, Visayas and Mindanao. Every sales of HWIC Product Pack in Sales Group A that matches with another sale of HWIC Product Pack in Sales Group B, the DEALER gets Php1,000 Override Commission. A maximum of 10 override Commissions per day. Every 5th Override Commission is converted to become a point. One (1) point is equivalent to Php1,000 value less withholding tax. The every 5th Override Commission is cumulative. An update regarding accumulated points will be reflected in his check disbursement slip. A DEALER can make an inquiry regarding his points at the Customer Service Department. Printing of Network Genealogy will be available everyday. Every DEALER's DPN is required to have an Annual Sales Maintenance of 7 points (equivalent to 1 HWIC Product Pack) in order for the DEALER's DPN to remain in the HWIC Network for the following year. Upon completion of the 7 points, the DEALER therefore claims a new HWIC Product Pack. If the DEALER was not able to reach 7 points up to his anniversary date (1 year), he has the chance to pay off the corresponding cash equivalent of the lacking points. A grace period of three (3) months is given to each DEALER to pay for the cash equivalent of the lacking points OR to auto-deduct from his Override Commission to complete his 7 points. If in case a DEALER was not able to meet the Annual Sales Maintenance of 7 points despite the grace period given to him, his DPN will no longer exist in the System. The DEALER's 8th point and onwards are converted to HWIC Coupons. HWIC Coupons can be used to claim or redeem various health products in our Health e-Store or different packages of appliances, gadgets, travel and leisure, in our Wealth e-Store published and posted in the company website. One (1) HWIC Coupon is equivalent to Php1,000. If a DEALER already wishes to use his HWIC Coupons, he can have them printed at the Genealogu Section. HWIC Coupons must be used within one (1) week of printing.